This article investigates the effectiveness of an information inference mechanism on Chinese text. 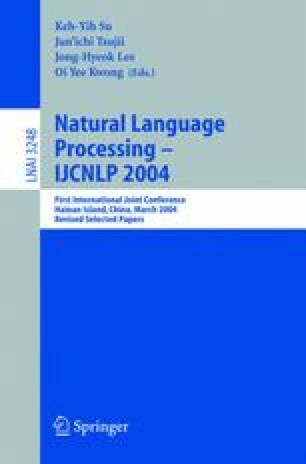 The information inference derives implicit associations via computation of information flow on a high dimensional conceptual space, which is approximated by a cognitively motivated lexical semantic space model, namely Hyperspace Analogue to Language (HAL). A dictionary-based Chinese word segmentation system was used to segment words. To evaluate the Chinese-based information flow model, it is applied to query expansion, in which a set of test queries are expanded automatically via information flow computations and documents are retrieved. Standard recall-precision measures are used to measure performance. Experimental results for TREC-5 Chinese queries and People Daily’s corpus suggest that the Chinese information flow model significantly increases average precision, though the increase is not as high as those achieved using English corpus. Nevertheless, there is justification to believe that the HAL-based information flow model, and in turn our psychologistic stance on the next generation of information processing systems, have a promising degree of language independence.